The Seas of Magic are ever changing and leaking into the surface world and vying with the winds of magic for control of the mystical world. Illusions and mirages are common place in coastal shallows and on small islands where this occurs. Many coastal dwellers have been deceived by what they believe they espy from afar, only to find nothing on closer inspection. The Nautican mages have captured this illusionary energy in an Orb. The Nautican army can take one additional illusionary unit of up to 15 Nauticans* into battle. The unit is but a mirage and whilst it can be made to move as if it were a real unit, it cannot shoot, fight, or cast any magic or count towards any benefit that a normal unit might bestow upon an army. The unit acts in a normal manner with regards to incurring casualties from missile fire. If the unit is targeted by magic the illusion is lifted as soon as the spell is successfully cast or the bound item is used and not dispelled. Once an enemy approachs to within 12 inches the illusion is immediately lifted and the enemy can see that the unit never existed. * Only Nauticans with the Seaborn rule. The Oceanic Rapture is a mythical event long held as fact by the Nauticans. They perceive a time when Chaos will ruin all lands and seas and the gods will rescue their souls before the ending of the world. At the start of any Nautican turn, the bearer of the ring can increase all of his starting profile characteristics by +2 until the beginning of the following Nautican turn at which point his form and soul disappears from the battlefield. 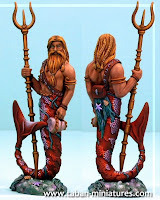 The Nautican has irrevocably committed his soul to the Gods of the Seas to dwell ever more in the After Deep and the Nautican model is removed as a casualty. This action is irreversible. Enemies gain victory points for as though the Nautican had been slain by their actions. A small glass vial containing rare exquisite sea salts that can be administered to cure anything but the most mortal of wounds. A unique pearl of magnificent, priceless beauty. Enemies in sight of the pearl are overcome with desire to possess the wonderous gem. The bearer can target 1 enemy unit within 12" and line of sight. The targeted unit must pass a leadership test or move directly towards the bearer at the maximum allowable rate, charging if possile. Units immune to psychology are not affected. These talons belonged to one of the first and mightiest of giant Sea Eagles that preyed on the Nautican people when they hunted in shallower waters. The Eagle was evetually destroyed by Nautican magic which denied the eagle it's natural gift of flight. These giant talons strike doubt into the minds of enemy flyers which fear that they might lose their ability to fly should they come into contact with the talons. Flyers must pass a leadership test to be able to charge the bearer or the bearer's unit. This horn reverberates around the battlefield with a reassuring sound of the waves that brings courage to the Nauticans. Famed for their stealth and hunting skills, the conger is rarely seen or captured. The bearer becomes a skirmisher and gains the special scout rule. If he jons any non-skirmishing units he permanently loses these skills.